If you do, then what’s the reason for you to budget? I don’t and I don’t know whether that’s a problem for me or not. The main reason of not have a budget is that, after all these years, I feel I can self-control my spending without relying on hard numbers to tell me how much I should spend. I don’t have the urge to spend money: I have no fancy toys like iPod, iPhone, or Wii game console. For most of the workdays, I almost don’t spend any money: the $40 cash I have in my wallet can last weeks. I always hear suggestions like using cash instead of credit cards to avoid/reduce debt, but I am doing just the opposite: I use credit cards to pay everything, from $2 postage to $4,000 car payment. Most importantly, saving and investing always come before spending: every month, we invest in our savings accounts, investment accounts, college savings accounts, and retirement accounts automatically, and all the bills are paid on time. From the way I spent money, I consider myself frugal, though not frugal enough to know where every dollar went. Last night, I took a look at how we spent our money since July 2006 when I started to track our credit card balance every month. The reason for doing so is to see whether lacking of budgeting/planing has made us spending more than we should have, one way to prove that budgeting isn’t always necessary. 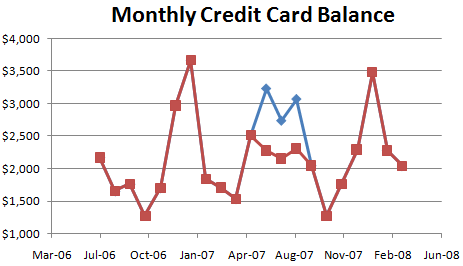 Above is our monthly credit card balances from July 2006 to March 2008, ranging from $1,300 a month to more than $3,500. It’s not a long history, but the patter is quite clear: we spent a lot more during the holiday season (November, December and January) than other months of year. Except last summer when we had some one-time expenses (for example, we paid nearly $600 medical bills in June, spent $960 on car maintenance in July, and paid $560 car insurance in August), most of our credit card bills are below $2,000/month. And if I do a year-over-year comparison, our average monthly spending from July 2007 to March 2008 is about $100 more than the same period one year ago (excluding the one-time expenses mentioned above (red line in the figure))! And I can blame the rising food and fuel prices for that $100 increase. Of course, the addition of our second child last spring also contributed. I never had a budget and I really don’t think I need one! We have a monthly budget that I track and update once per week. To answer your “Why?” question: because planning and sticking to a plan greatly increase your chances of reaching your goals. It also helps us see where we make mistakes, and can then correct them. It isn’t a strict, “must stick to every penny” budget. We use our AMEX Blue Cash card for 99% of purchases, so if the grocery bill is $56 this week instead of $55, we spend the $56 and cut back the next week. No Debt Plan: Thanks for sharing your experience. For your information, there is a great little online personal budgeting website that is totally free and truly anonymous. 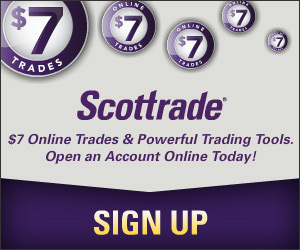 It lets you open your private budget account with just your e-mail and asks nothing more from you. You are immediately given a great looking, easy to use straight forward budget page, and you can also generate monthly reports to your e-mail for safe keeping before end-of-month closing and starting a new month. The budget categories are not user modifiable but the set is very rich and flexible covering just about any practical category plus a few catch all miscellaneous category, not a bad deal for a free utility. And there is an instant super easy to use online users billboard that holds discussions among users and the developer too.